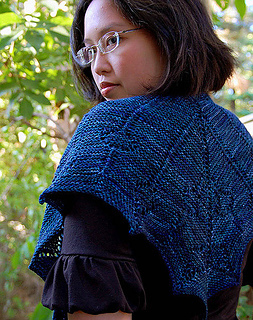 This little reversible shawl is super quick to knit and perfect to drape over your shoulders or wrap around your neck for that little bit of warmth (especially against over-zealous air conditioning!). Perfect for that special ball of sock yarn or handspun that you’ve got hidden away in your stash. And if you don’t have one of those, pick some up! Technical Editing by Kim McBrien (indigodragonfly). 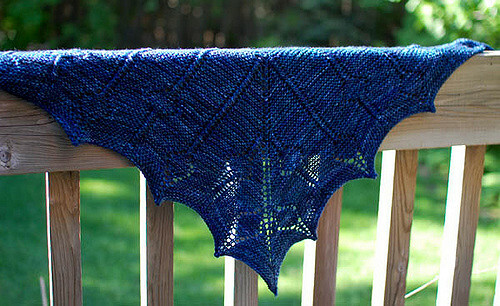 54 inches / 137 cm across straight edge of shawl; 19 inches / 48 cm deep down centre. 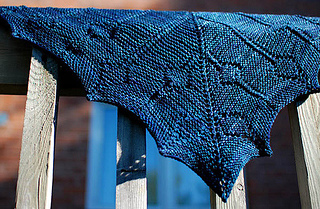 Shown in Handmaiden Casbah (one 115g skein). 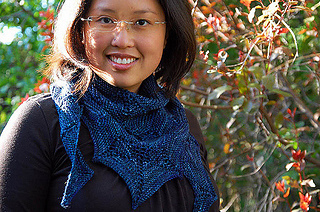 Shawl is knit from the centre back neck down in garter stitch (all rows are knit). Both charted and written directions are given. 7-page PDF pattern contains 6 charts in full colour.